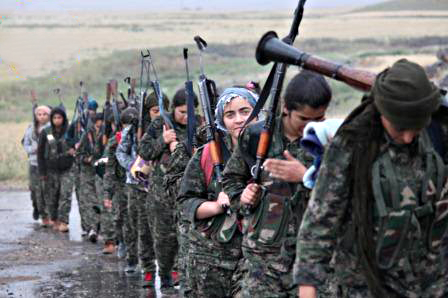 KOBANI – The terrorist group of ISIS which had planned to occupy Kobani within a week has failed because of the heroic resistance of YPG/YPJ fighters. This is 108th days of barbaric attacks by ISIS on Kobani, where YPG/YPJ are gaining more ground and eliminating terrorists. Our forces managed to liberate “Maktaba Resh” and “water tank” areas south of 48 street when it carried out operations against the terrorist groups of Daesh led to killing 24 terrorists, seizing 5 bodies beside an amount of weapons and ammunition. During these clashes three of our fighters martyred after a heroic resistance. KOBANI– The historic resistance against the terrorist attacks of Daesh (ISIS) terror organization in Kobani continued on the 107th day. Conducting non-stop operations, our forces of the People’s Defense Units (YPG) and the Women’s Defense Units (YPJ) are advancing inside the city. An assault operation was conducted against numerous terrorist-occupied areas in Maktaba Resh area inside the city. After heavy clashes, our forces were able to liberate the southern and eastern sides of this region from terrorists. In the battle on this area 6 members of Daesh terrorist forces were confirmed killed. Our forces also managed to seize a number of the terrorists’ weapons and ammunition in Maktaba Resh area after search and mop-up operation, the weapons captured on this area are: 7 AK-47 rifles, 2300 bullets for AK-47, 30 AK-47 magazines, 2 RPG-7 rocket launchers, and 7 vz. 24 plus a filming device. In the north-east of Kobani, our forces led an operation against the terrorist groups. During the assault on Kaniya Kurda neighborhood a minor battle was experienced where 1 terrorist was confirmed killed. In 2014 we have witnessed terrorist attacks by the terror organization of Daesh (ISIS) against people and the forces who would stand in the face of their barbaric mentality. Women, children, and the elderly were not salvaged from their brutality. Along with Daesh terrorism, the earlier attacks by the Free Syrian Army, several Islamic battalion, and the forces affiliated to the Syrian Regime were in order to light the fire of war in the cities that normal life was ongoing, against the civilians. Not just inside the Syrian borders, the terrorist forces of Daesh (ISIS) faced towards Iraq and started a war with the Iraqi army and Peshmerga forces of the Kurdistan Regional Government, in an attempt to instill fear in people’s hearts, and controlled several strategic areas.